The 26 and 27 are the venturi sizes for each barrel. Oooo thank you for this. I have a 240 from a late 320i that I'll be installing hopefully this summer. This helps lots!! You have to make your own. I used a 20 inch Lokar cable to make mine. Works ok but needs adjustment. It's attached to the original throttle rod and mounted to the brake booster mount. Sorry I dont have pics at the moment. Hey Jim. Its a MAF. Here's a generic one, but the Bosch unit is exactly the same withthe screw on the left. Later LH verions dont have the adjustment screw. Anyone ever run a Weber DCNF carb? Just wondering if anyone has ever run a 40 DCNF carb on their 2002. I know the linkage and bolt pattern would be all wrong but hmmmm. There's one for sale locally cheap and I'm thinking out loud again lol Thanks! Thanks everyone for your help. 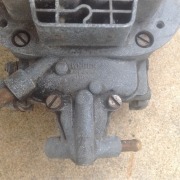 Gordon, I emailed Mr. Taylor regarding the intake manifold. Thanks.